As of mid-November, the Supreme Court decided to not even hear the suit brought against the Washington Redskins regarding their name. This action brought a close to the case, but not the movement. The Supreme Court did not comment as to why they chose not to hear the case, which only raises more questions than their decision answers. • (1933) The Boston Braves of the NFL change their name to the Boston Redskins. In the team's brief to the court, the name change was "in honor of the team's then-head-coach, William 'Lone Star' Dietz, a Native American." • (1937) The Redskins move south, to Washington D.C.
• (1946) A Federal Law is passed that prohibits the government from registering a trademark that disparages any race, religion or group. • (1967) The U.S. Patent and Trademark Office grants a formal trademark to the Redskins, which has since been renewed several times (possibly against Federal Law). • Other trademarks have been issued to the team in 1974, 1978 and 1990 (also possibly violating Federal Law). • (1992) Seven activists, led by Suzan S. Harjo, challenge the Redskins trademark issued in 1967. • (1999) The Trademark Trial and Appeal Board finds in favor of the activists. • (2003) U.S. District Judge, Colleen Kollar-Kotelly ruled in favor of the team. • The suit was brought based on the 1946 Federal Law that prohibits the registration of a trademark that disparages any race, religion or group. • Those who ruled in favor of the team recited the Doctrine of Laches, which essentially states (in the context of this case) that the activists waited too long and are causing a disadvantage to the team, which has invested millions of dollars in its name. • The activists' claim that the trademark never should have been issued in the first place, since the law was written in 1946 and the trademark was first granted in 1967. • Whether the Doctrine of Laches applies to the Federal Law regarding the trademark of symbols and names deemed disparaging, since someone new could find the name offensive essentially everyday, in theory, as more people turn 18 and become legal adults who can bring suits. As I had previously mentioned, the movement is far from over. A new group of plaintiffs, ages 18 to 24, have filed another suit which has been on hold for the last two years while the most recent case was decided. Since this group of plaintiffs filed right as they became of age, the Doctrine of Laches theoretically should not apply. What I find more disturbing is that the Supreme Court did not even hear a case in which Federal Law appears to have been broken. I wonder if their unwillingness to comment stems from the knowledge that once the procedural hurdles are no longer a factor, they will have no choice but to weigh the case on its merits, not its technicalities. The court's unwillingness to rule essentially punishes all Native Americans for the actions of some who didn't exercise their rights. What does this mean for the "Washington Redskins" brand? If the court revokes the trademark or decides not to renew it in the future, then anyone and his/her mother can sell "Redskins" merchandise without penalty. At this point, I would think the NFL would want to step in and protect its assets, thus forcing the Washington franchise to re-brand to a trademark-able moniker. Another question raised by the suit is why those in power (Dan Snyder, Washington Redskins owner, and Roger Goodell, NFL Commissioner) would want to be associated with this negative stigma which affects their brand(s). With Dan Snyder, the answer is simple: he grew up watching the Redskins and refuses to alter them in any way in his personal pursuit of nostalgia. Goodell is trickier, though. Since becoming Commissioner, Goodell has worked diligently to clean up the league's image, imposing strict and lengthy suspensions for players who violate the law and the NFL's Personal Conduct Policy. At what point does he hold the owners as accountable as the players for their actions? The Redskins name tarnishes the NFL as much as Pacman Jones or Michael Vick ever could. In light of these developments, I am going to propose a "Name-the-Team" contest. Anyone who would like to provide a new name for the Washington football franchise only needs to suggest a name in the Comments section at the end of this post. I will take the best answers and provide identity schemes including logos, colors, wordmarks and uniforms. Let the contest begin! The design portion of this week's post features a treat for the Wisconsin readers out there. 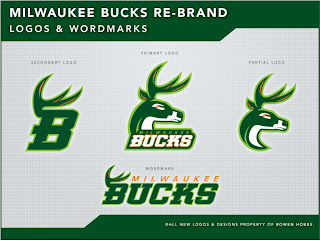 I have developed a re-branding concept for the Milwaukee Bucks. The colors throwback to the 80s with forest green and lime. Orange is also involved as a connection to Wisconsin's rich deer-hunting tradition. The logo features a buck in profile, while the secondary mark is a B with antlers. 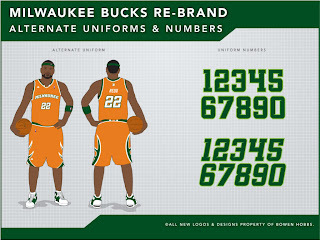 The uniforms also draw inspiration from the 80s with bold trim and inserts on the sides. 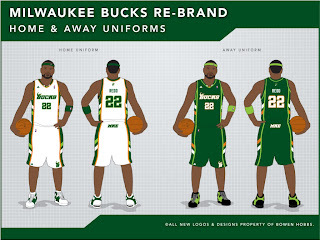 The alternate uniform features a "Milwaukee" wordmark and antlers on the shorts. Feel Free to comment on the Redskins' legal issues or the designs above. And don't forget to Name-the-Team. Could you tell me if you sell these logos? I am interested in talking with you further about the possibility of selling one (or more) of my logos. Please contact me at bowenhobbs@yahoo.com so we can discuss further.